All transactions are safe and secure with a reliable history in online purchasing behind each of our associates. 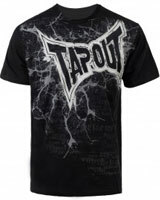 Buy the TapouT Breakthrough t-shirt to own UFC clothing and merchandise. The front of this dark Tapout tee displays a cracked cement design with the brand's logo printed across the chest. Old style text appears behind the entire design on this Tapout t-shirt. The tee's attention grabbing design is not for the faint of heart. Wear it to intimidate your challengers, or while watching the next pay-per-view. This piece of Tapout apparel is also enough to inspire you to train harder. It looks great with a pair of MMA fight shorts, or a stylish UFC or Tapout hat. In addition to the TapouT Breakthrough tee above, browse the UFC Clothing Gallery for more apparel like men's and women's clothes, kids shirts or hoodies.